The barbell clean is a compound exercise that works many muscle groups to move many joints. This Olympic style exercise uses a barbell or dumbbells, requiring your muscles to exert force in an explosive manner. Combining force and speed increases power, which is the ability to generate force quickly. 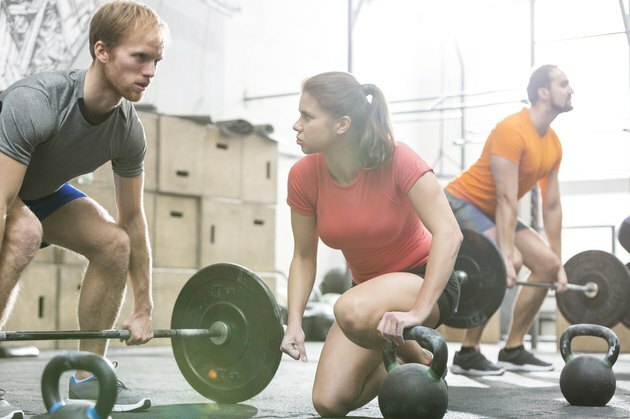 Barbell cleans can be a part of a sport-specific training program to improve core, abdominal and lower back strength, balance and coordination for enhanced athletic performance. Learn proper form and technique to maximize strength and power gains while minimizing injury risk. Start behind the barbell on the floor with your feet just under the bar, shoulder-width apart. Bend your hips and knees, extending your arms, grasping the bar with an overhand grip. Keep your head up and your back straight with your arms on the outside of your legs. This position contracts your hamstrings. Your abdomen is also contracted to prevent your back from arching. Keep your weight back on your heels to keep your knees above your ankles and not too far forward. Keeping your weight back on your heels, drive your body up by using your buttocks and quadriceps, the front of your thighs, to extend your hips and knees. Lift your entire body at the same time to avoid bending forward at the waist. Keep your arms extended as the barbell is lifted off the floor, keeping the weight close to your body. Continue to contract your abdomen to avoid arching your back. Muscles worked during this phase include your buttocks, quadriceps, abdomen and lower back muscles. When your body is fully extended, continue to pull the barbell up. First bend your elbows and pull them up by shrugging your shoulders. This movement is done quickly with a slight jump as you pull your body under the barbell. Your forearm, shoulders, trapezius, or neck muscles are working during this phase. Your hamstrings, buttocks, abdomen, calves and lower back muscles contract to maintain body position while landing from a slightly airborne position. As soon as your body is under the barbell, rotate your elbows, bringing your forearms down in front of your body. Rest the barbell on the front part of your shoulders. Squeeze your shoulder blades together to prevent your body from tilting forward. Keep your buttocks and abdomen contracted to maintain balance and stability. Muscles used during this phase include your latissimus dorsi and rhomboids, your back muscles, assisted by your biceps. Hold this position for about five seconds before returning to the starting position. In one movement, extend your arms down while bending your hips and knees to lower your body. Keep your weight back on your heels to avoid bending forward. Keep your back straight while lowering the weight back to the floor.